Christmas Cake & exams, not much happens here. Thursday 7th - EGM Held to fill vacant admin position. There were no candidates. The committee asked to modify the constitution to reduce the size of Helpdesk from 3 to 2. This was not passed. Monday 25th - Techweek begins with the Video Editing Tutorial by Allen Dixon. Later that day there is a launch party in the old bar, which was epic win. Tuesday 26th - Install Fest in the seminar room, followed by Filmsoc's showing of DieHard 4pointless. Wednesday 27th - Techweek continues in the seminar room with talks from demonware, Sean Hand, and Colm MacCarthaigh. Thursday 28th - Web Design & Photoshop workshops, followed by Q-Zar and beers. 4th - Amy deemed to be resigned for missing lots of committee meetings. She won't be replaced until the AGM. 7th - Deadling for socs awards. Redbrick submits nomination for Most Improved Society. The competition will be: College View, FotoSoc, Flashback, Juggle Soc & St Vincent de Paul. Redbrick also submits a nomination for Tech Week, which will be competing against Ross O'Carrol Kelly, Arts Week, Fame the musical, Debate's DCU Open, European Business Weekend, Jugglesoc's Unicycle to Galway, MPS's Shag pad, and the Andorra Trip. 11th - Follow up workshop to the Linux Install Fest held. 1st - Redbrick annual table quiz is held. Western Digital Passport 160GB external hard drives are given to the winners. gamblitis wins the raffle of an EEE PC. elected by a majority show of hands. Redbrick wins Best Website at the Clubs and Socs Awards, which were held in the Helix on Thursday 10th of April. Redbrick Chairperson Andrew Harford wins a First Five award for Best Individual. 17th - Redbrick wins Best Society Website of a Large College at the BICS Awards in Dundalk - Best Website in Ireland! 19th - Admins take down Murphy for a while to rearrange disk partitions, because /var/tmp really doesn't need 105GB. This part goes suspiciously smoothly, with nothing breaking. Admins then begin to move vhosts to murphy (unrelated, but we had planned it today anyway). This part takes 6 hours, and involves pain and cursing at computer screens, and werdz committing his second ever IAF when he accidentally deletes the apache configuration, and realises we had no backups of it. Luckily, the important parts were modularised (thank you, Debian), so restoring the default configuration and rewriting our bits only took about half an hour. The Redbrick main site is then moved to murphy's local disks, and everything is faster afterwards. 24th - It is pointed out in #lobby that Redbrick hasn't been rooted in years. 25th - Redbrick gets rooted. Elected root holders (three out of four of them on INTRA) cry. Decision taken to take redbrick offline at about 10am. Network is disconnected by taking down the interface connecting us to CSD on enzyme. Root holders in DCU spend the day running between fourth year projects and looking through logs looking for evidence of the intrusion. Reinstall begins later on, with the help of atlas. Minerva is reinstalled first, as it's needed for us to receive mail. First packages are installed again there by 9.50pm that night. The internet connection is switched back on and deathray is configured to receive and store mail by about 1am. Everything else remains unavailable, and the network is left in a rediculously complicated segregated state to stop anyone accessing anything. 16th - Redbrick chairperson, Robert "robby" O'Reilly, receives an email containing the Redbrick root password. He informs the committee of this, but then deletes the email. 22nd - Robby is told to resign by lil_cain in Fibbers. "RESIGN!" soon becomes a popular catchphrase and a rallying cry for disgruntled members and/or trolls. 23rd - Robby, the Redbrick chairperson, resigns from his position. was lost, and the array was re-built sucessfully with a replacement disk. spare disks available and installed in the event of future failures. chairperson, robby, and explain the circumtances leading up to this. this service, and that robby would delete this potential evidence. by anyone since before the network had been compromised. course of action was to discuss the issue further over the email. I expressed our discontent with the situation by telling robby he should resign. in public like that, and we apologise for our actions. 29th Academic year starts back up. CAIS and CASE are no longer streams of the CA course. Instead there are now two courses: Computer Applications (CASE) and Enterprise Computing (CAIS). For some reason EC does not actually require you to do programming and is considered a joke by some of the snobbier members of Redbrick. EGM also sees the sign up of those who are interested in a trip to Finland the home of attol and linux. Sometime before the 25th - Two of Redbrick's beloved Helpdesk team, Mr. Sean Hand and Mr. Gavin Tubritt, died in a mysterious fire in the server room, thus leaving the committee. The blaze is believe to have been caused by an overheated server catching fire, undoubtedly the result of bad adminning. Cian was unable for comment at the time of the tragedy, but there was a lovely smell of bacon in the server room afterwards. It is also revealed that Kevin Fox can't use bullet points in MediaWiki. 4th - Clubs and Societies Ball - The highlight of all soc heads calendar C&S ball this year in Citywest. Redbrick gentlemen don some suits while the ladies opt for the dresses. Great night had by all for those of who can remember. 11th - werdz presents workshop "Web design for beginners". 29th - Intersocs night. Location Bull & Castle. 1st - Downtime from 5pm - 5:30pm. Kernel updates. 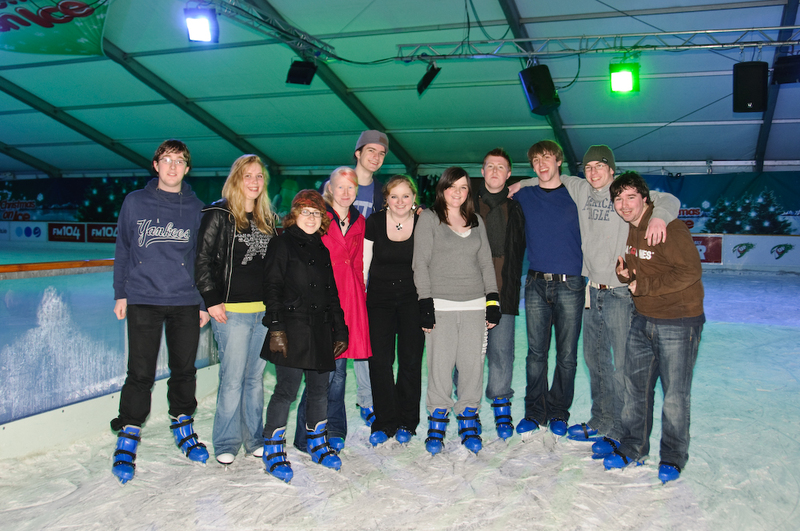 4th - Redbrick goes Ice Skating in the RDS pic. 16th - EGM held to elect new PRO, Carri is elected (landa2 also ran). This page was last modified on 6 May 2011, at 17:28.